Thesis: The most urgent and effective evangelists are those who have known and felt the agony of their own sin and the delight of Christ’s salvation. Many of us grieve over how pathetic we are at evangelism – both at on-to-one evangelism and preaching evangelistically. Some of us have tried to learn strategies and techniques to improve, without much long-term success. It’s after David has passed through the deep waters of tearful conviction and joyful (re)conversion that he says: “Then I will teach transgressors your ways, and sinners shall be converted to you” (Ps. 51:13). Two section of the book stood out. First, in chapter 1, Jeremy provides eight answers to the question: What are some of the holy pressures that carry us from being brokenhearted over our sin to being brokenhearted evangelists? The white ring of self-referential evangelism: Aiming to make ourselves look good or feel good. The black ring of social acceptability: Aiming to control or restrain a person’s sin. The blue ring of good citizenship: Aiming to help someone be a better citizen, father, wife, employee, etc. The red ring of good churchmanship: Aiming to get people to become members of our church. The bullseye of conversion to Christ: Nothing else will do! I believe this book will help many Gospel archers aim better, by helping us to aim the arrow first at ourselves. 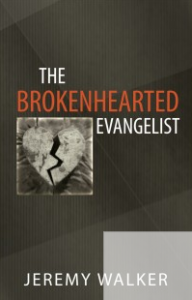 The Brokenhearted Evangelist by Jeremy Walker. Apart from regularly contributing to Ref21, Jeremy also posts at his own blog, The Wanderer.